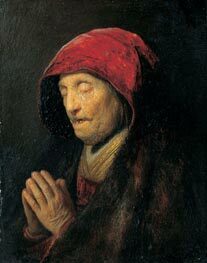 Rembrandt Harmenszoon van Rijn (July 15, 1606 - October 4, 1669) is generally considered one of the greatest painters in European art history and the most important in Dutch history. Rembrandt was also a proficient printmaker and made many drawings. His contributions to art came in a period that historians call the Dutch Golden Age (roughly equivalent to the 17th century), in which Dutch culture, science, commerce, world power and political influence reached their pinnacles. 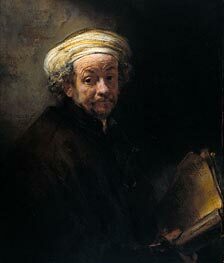 In all, Rembrandt produced around 600 paintings, 300 etchings, and 2,000 drawings. He was a prolific painter of self-portraits, producing almost a hundred of them (including some 20 etchings) throughout his long career. Together they give us a remarkably clear picture of the man, his looks, and - more importantly - his emotions, as misfortune and sorrow etched wrinkles in his face. Among the prominent characteristics of his work are his use of chiaroscuro, often using stark contrasts, thus drawing the viewer into the painting; his dramatic and lively scenes, devoid of any rigid formality that contemporary artists often displayed; and his ostensibly deeply felt compassion for mankind, irrespective of wealth and age. 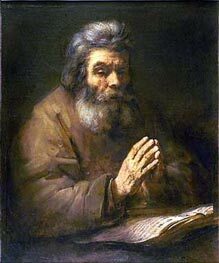 His immediate family - his wife Saskia, his son Titus, and his common-law wife Hendrickje - often figured prominently in his paintings, many of which had mythical, biblical, or historical themes. 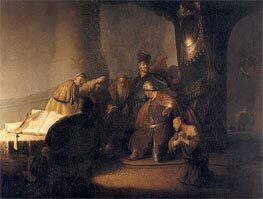 Rembrandt was born on July 15, 1606 in Leiden, the Netherlands. Conflicting sources state that his family either had 7, 9 or 10 children. His family was quite well to do; his father being a miller, his mother a baker's daughter. As a boy he attended Latin school and was enrolled at the University of Leiden, although according to a contemporary he had more inclination towards painting. His parents gave in and he was apprenticed with a Leiden history painter, Jacob van Swanenburgh. 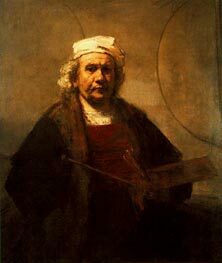 After a brief but important apprenticeship with the famous painter Pieter Lastman in Amsterdam, Rembrandt opened a studio in Leiden, which he shared with friend and colleague Jan Lievens. 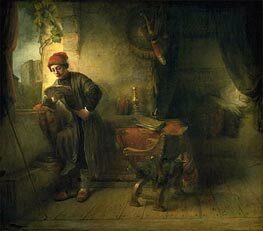 In 1627, Rembrandt began to accept students, among them Gerard Dou. 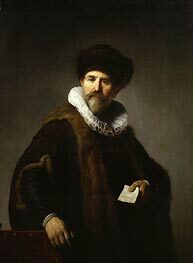 By 1631, Rembrandt had established such a good reputation that he received several assignments for portraits from Amsterdam. As a result, he moved to that city and into the house of an art dealer, Hendrick van Uylenburgh. 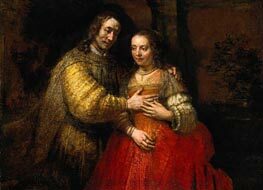 This move eventually led, in 1634, to the marriage of Rembrandt and Hendrick's greatniece, Saskia van Uylenburg. This was obviously a marriage for love. Although she came from a good family (her father had been burgomaster of Leeuwarden), Saskia was an orphan and was probably not very wealthy. She lived with her sister in Frisia and did not have many 'grand' connections in Amsterdam. These events, however, are widely disputed. In 1639, Rembrandt and Saskia moved to a prominent house in the Jodenbreestraat in the Jewish quarter, which later became the Rembrandt House Museum. Although they were affluent the couple had several setbacks in their personal life. Three of their children died shortly after birth. Only their fourth child, a son, Titus, who was born in 1641, survived into adulthood. Saskia died in 1642 soon after Titus's birth, probably from tuberculosis. After her death he began an affair with Titus's nurse, a widow called Geertje Dircx. This ended in a lawsuit. 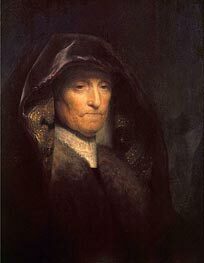 Geertje claimed that Rembrandt had broken his promise to marry her, and demanded that the council force him to marry her. 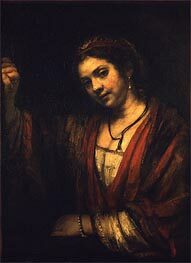 The council did not go that far but Rembrandt was asked to pay her a lot of money. He then cooperated with Geertje's family to have her locked up in a 'spinhuis' (house of correction) in Gouda. 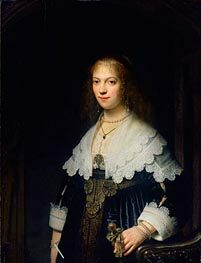 In the late 1640s, she was succeeded as Rembrandt's mistress by the much younger Hendrickje Stoffels, who initially had also been Rembrandt's maidservant. In 1654 they had a daughter, Cornelia, bringing Hendrickje an official reproach from the Reformed church for "living in sin." 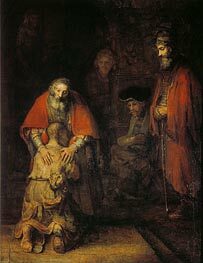 Rembrandt was not summoned to appear for the Church council because he was not a member of the Reformed church. Rembrandt lived beyond his means, buying many art pieces and especially prints (often used in his paintings), and rarities, which probably caused his bankruptcy in 1656. He had to sell his house and move to a more modest accommodation on the Rozengracht. Here, Hendrickje and Titus started an art shop to make ends meet. 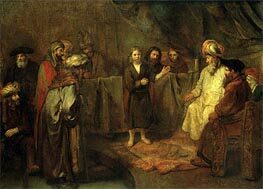 However, Rembrandt's fame did not wane in these years, since he received an important commision for a large history piece for the newly built city hall. 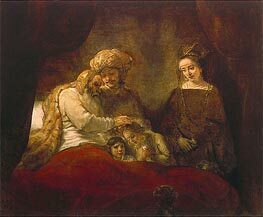 Rembrandt outlived both Hendrickje and Titus. In the end, only his daughter Cornelia was at his side. 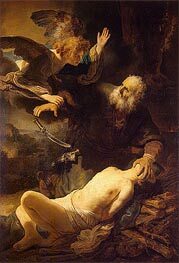 The bereaving death of his much beloved son took heavy toll on Rembrandt and soon after that he died October 4, 1669 in Amsterdam and was buried in an unmarked grave in the Westerkerk. 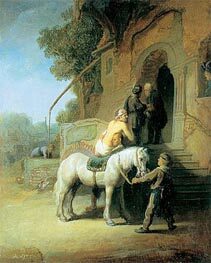 It was during Rembrandt's Leiden period (1625-1631) that Lastman's influence was most prominent. Paintings were rather small, but rich in details (for example, in costumes and jewelry). Themes were mostly religious and allegoric. During his early years in Amsterdam (1632-1636), Rembrandt used large canvases and strong tones and depicted dramatic scenes. 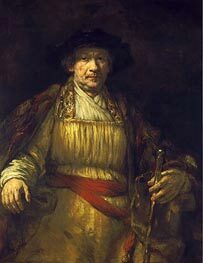 Rembrandt painted many portraits in this period. Other paintings had biblical and mythological scenes. 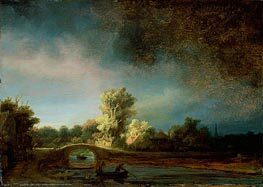 In the late 1630, Rembrandt painted many landscapes and produced etchings about nature. In this period, his landscapes were tormented by nature, showing trees taken down by a storm or ominous skies with dark clouds. 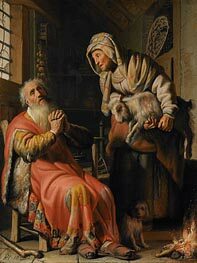 Starting in about 1640, his work became more sober, reflecting the family tragedies that he had suffered. Exuberance was replaced by deeply felt inner emotions. Biblical scenes were now derived more often from the New Testament instead of the Old Testament, as had been the case before. Paintings became smaller again. An exception is the huge painting The Night Watch, his largest, which was as worldly and spirited as any previous painting. Landscapes were more often etched than painted. The dark forces of nature made way for quiet Dutch rural scenes. 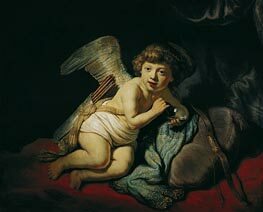 In the 1650s, Rembrandt's style changed again. Paintings increased in size. Colours became richer, brush strokes stronger. With these changes, Rembrandt distanced himself from earlier work and current fashion, which increasingly inclined towards fine, detailed works. 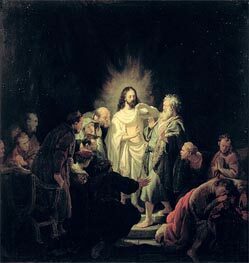 Over the years, biblical themes were still depicted often, but emphasis shifted from dramatic group scenes to intimate portrait-like figures. In his last years, Rembrandt painted some of his finest self-portraits, showing a face on which grief and sorrow had left their marks. 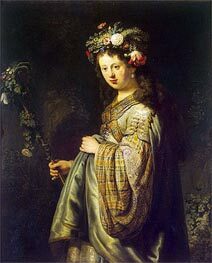 In the Netherlands, the most notable collection of Rembrandt's work is at Amsterdam's Rijksmuseum, including De Nachtwacht (The Night Watch) and De Joodse bruid (The Jewish Bride). Many of his self-portraits are held in The Hague's Mauritshuis. His home, preserved as the Rembrandt House Museum in Amsterdam, houses many examples of his engravings. Prominent collections in other countries can be found in Berlin, St. Petersburg, New York City, Washington, D.C., The Louvre and the National Gallery, London. Rembrandt painted The Militia Company of Captain Frans Banning Cocq between 1640 and 1642. 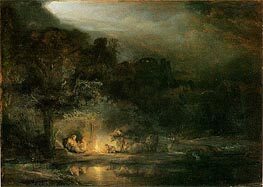 This picture was called the Patrouille de Nuit by the French and the Night Watch by Sir Joshua Reynolds because, upon its discovery, the picture was so dimmed and defaced by time that it was almost indistinguishable and it looked quite like a night scene. After it was cleaned, it was discovered to represent broad day - a party of musketeers stepping from a gloomy courtyard into the blinding sunlight. The piece was commissioned for the new hall of the Kloveniersdoelen, the musketeer branch of the civic militia. 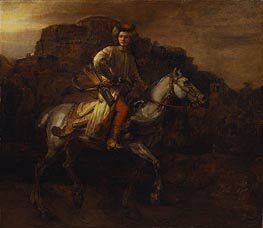 Rembrandt departed from convention, which ordered that such genre pieces should be stately and formal, rather a line-up than an action scene. Instead he showed the militia readying themselves to embark on a mission (what kind of mission, an ordinary patrol or some special event, is a matter of debate). His new approach caused a row, especially among the militia members who ended up at the back of the scene and were hardly visible. Payment was delayed. Parts of the canvas were cut off to make the painting fit on the designated wall when it was moved to Amsterdam town hall in 1715. This painting now hangs in the largest hall of the Rijksmuseum in Amsterdam. It is a large painting that takes up the entire back wall - despite having had bits cut off - and is arguably one of the most impressive paintings displayed there.